Its free from lion brand again, and I am making it a sweater dress that hits above the knee. Ive been looking for a nice sweater dress and having no luck finding a nice one for under 100 dollars. I expect that this would take forever (probably 6 month since im knitting just a little at a time) , but I am using organic cotton and am looking forward to the softness of the dress next year. Only $60 dollars. That is less than cost of yarn. HMMM!!! Granted, it is made from a wool/poly blend, probably not soft like my organic cotton. But it is the length I wanted and I can have it now… not a year later. On the other hand, I cant wear a dress like this (not convenient for breastfeeding) for anther few months, and the sweater above looks a little flatter than the handknit ones. So what to do? knit, or buy? The two designs are eerily similiar! 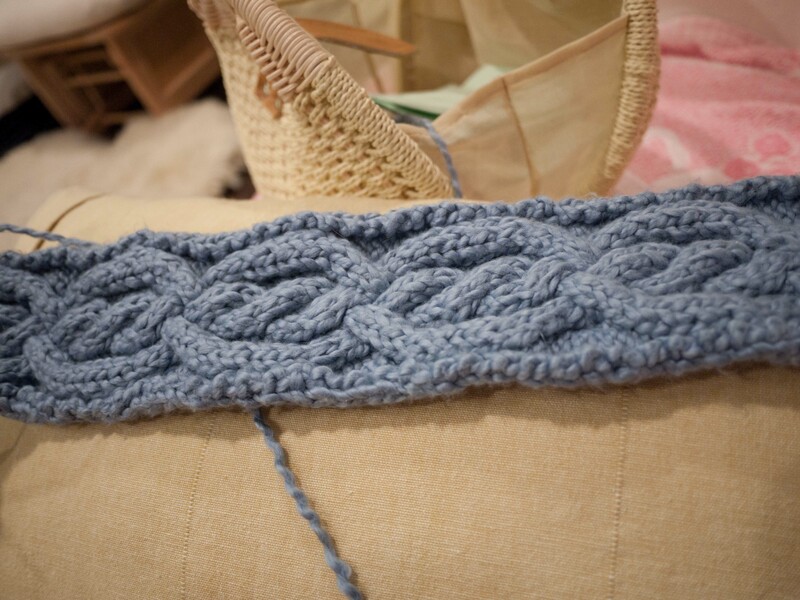 This entry was posted on Thursday, December 15th, 2011 at 9:20 pm	and posted in knitting. You can follow any responses to this entry through the RSS 2.0 feed. Both designs are cute, and they are based on a sweater from Pringle of Scotland (or something like that) that first had that beautiful sideways cable. I would go with the ready to wear version, to be honest: I think cotton is too heavy for this garment anyway and has little elasticity, so your dress will stretch out of shape quickly. Anyway, good choice of dress, it’s a very interesting and elegant design. woo! I did know know that (about Pringle of Scotland), thanks for telling me! I did not know that cotton isnt a good choice for knitting sweater dresses, but it does feel heavier and does seem to be less elastic i think you are right, i should probably just buy the ready to wear. thanks!! both look good. Have you considered how much you need a knit dress vs. all the other things that keep you busy in your life? I wish I could offer a solid opinion on which I like better, but they look very very similar! You’ll look good either way I think! true, with the time for this dress, i can probably make a few coats and dresses… etc… perhaps i should prioritize more efficiently! I’d go with the handknit, personally….but then, I can’t wear wool, so it’s the only way I can get it! But since that’s not a problem for you, I’m sure you can find something else to do with the yarn if you choose to get the RTW, right? I just saw a Calvin Klein sweater dress in Winners (Canadian TJ Max) and it was already pilling on the rack. There was also a Jessica Simpson cabled sweater dress with cap sleeves that looked in better condition. Paid $68CAN for it and love it.